Share the post "Windows of Inspiration"
For me, it was a bit unusual Sunday morning due to an early appointment I had to show a home to some buyers I’ve been working with. Many apologies were made for such an early time–especially it being Sunday. I’m always quick to remind buyers that an active Realtor will always try to work around their work schedules. Little did those buyers know that tomorrow evening, I have to show a home I have listed at very late hour–especially since it gets dark here all the sooner. The showing went well and I’ll not be surprised if my buyers make an offer coming on it this week. About another hour of my day was spent checking on vacant listings just to make sure their furnaces were running. With it being a biting -4 degrees this morning, a home without heat can come down with a disastrous case of frozen pipes. I just recently mentioned to client how even the smallest of openings to the exterior of a home or building can create more heat loss than one could possibly imagine. A number of years ago I took a half-day seminar on things people can do to make their homes more air-tight. One of the major heat losses most don’t consider, is not making sure all window and door frames are properly caulked. There was a square-inch example of how much air is lost by measuring the amount of un-caulked areas around a given door which oft times equates to being larger than the size of a normal brick. Can you imagine a hole the size of a brick in your home’s exterior wall being exposed to outdoor temperatures? Well, that’s how much heat and/or cooling is lost. Far too many people get overly-hyped while insisting on thermal windows and willing to pay thousands of dollars to have their original double-hung windows replaced with them. You may think me crazy, but it’s been proven that if your double hung windows are fully glazed and their weights and ropes are properly working, along with having tight-fitting combination storms, and then going forward in time, there’s no financially sound reason to replace them. I made a huge mistake several years ago by purchasing five new mid-priced thermal replacement windows from Menards, and after having them properly installed, I discovered they leaked air far more than the old double-hungs they were replacing. Just this year I had to replace two windows that weren’t worth fixing, but this time I ordered them from Source One which used to be Pro Build. Thank goodness they work much better and don’t leak air. I just now remembered reading an article some years ago about historic districts in European cities that require the owners of old homes and buildings that are being re-furbished to replace all that’s removed with the exact components on the entirety of their exteriors. You may laugh, but they even so much as insist on the exact types of nails and screws. The remainder of my day was spent helping a friend get her personal belongings packed up and readied for a move at the end of this month. It’s been over two years since I’d done any packing like that, but it didn’t take long for me to be reminded that it’s not one of my favorite chores. Thank goodness she’d purchased some good pasteboard boxes that were meant for moving because they were the right size and easy to seal. My friend didn’t realize how very sick I was getting with all that packing and thank goodness we ran out of boxes because I’m afraid I’d still be there. Before walking out her front door, I took a good look at those 12 big boxes I’d packed, sealed, and boldly written their contents on their top covers, and then turning to her and saying, “I think all of us have no idea how much excess we have until it comes our time to move.” Thank goodness I did enough to where she’ll be able to take care of the rest. Since she’s older and not good with getting up to high places, I think she greatly appreciated my getting down all the things she’d stored in all her tall cabinets which required the use of a step stool. 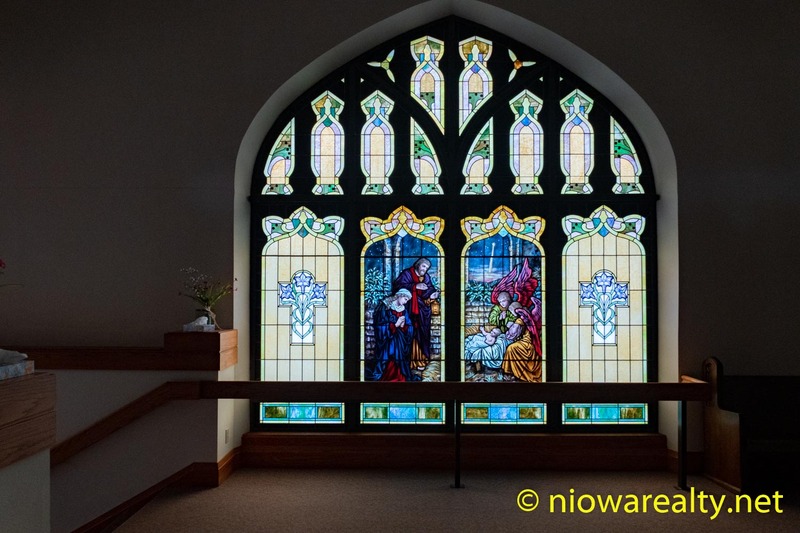 The above photo is one of my “Windows of Inspiration” which I took while visiting Salem Lutheran Church in Lake Mills last week. I thought it appropriate since we’ll soon be entering the season of Advent. Their stained glass windows are absolutely stunning, and I’ll be sure to share all the more of them and leave all of you be the judge. Tonight’s all the more thought-proving one-liner is: Whenever you find yourself on the side of the majority, it’s time to pause and reflect.